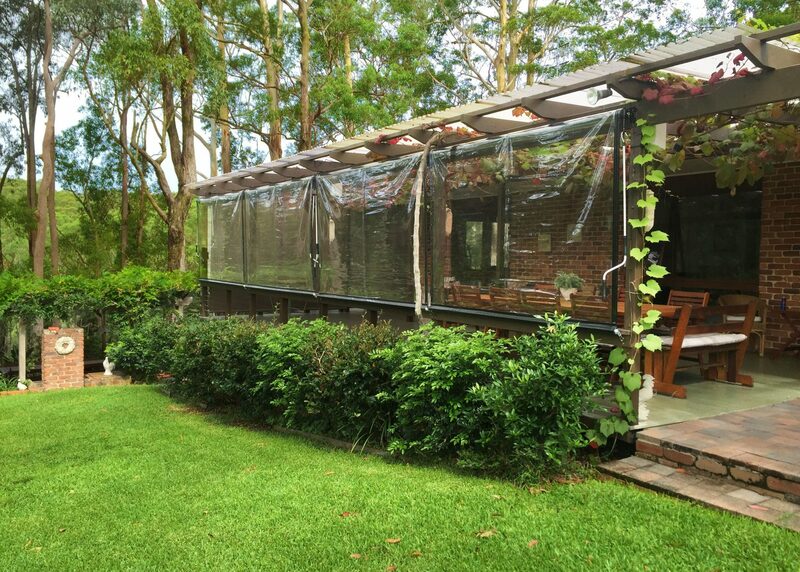 Retractable awnings let owners control the weather on their own terms. 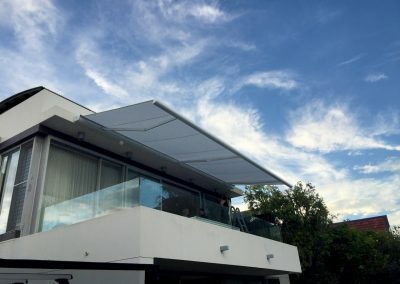 When passing showers threaten, or when the sun gets too hot, they or the systems sensors unroll the awning for near-instant protection and shade. 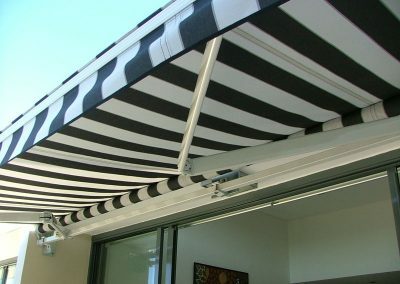 Because awnings prevent the sun from shining through windows and sliding glass doors, they can keep temperatures inside the house cooler, can help prevent carpets and furniture from fading in sunlight and provide a sheltered place for children and pets to play, shielded from direct sun. A retractable awning can do all this without the need for poles or floor support, maximising full use of the space. Retractable awnings are fixed to an existing structure and project outwards up to a maximum of 4.1m. 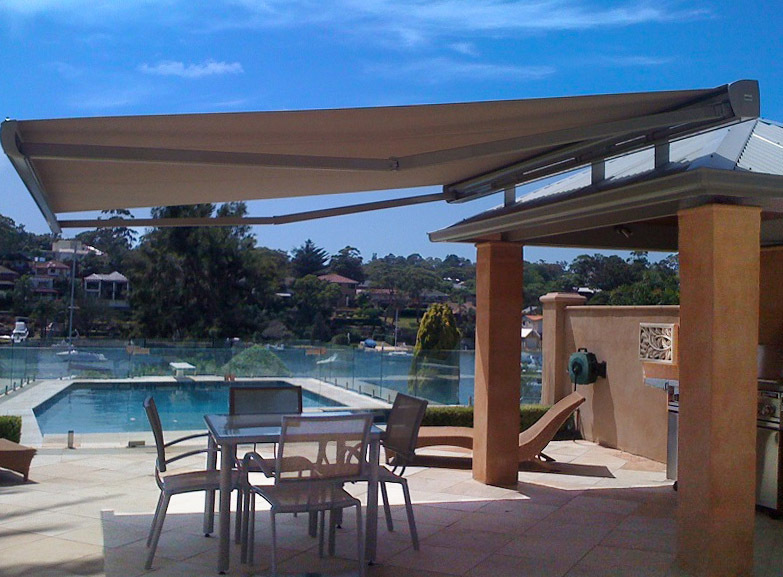 The maximum width of a retractable awning is 12m. 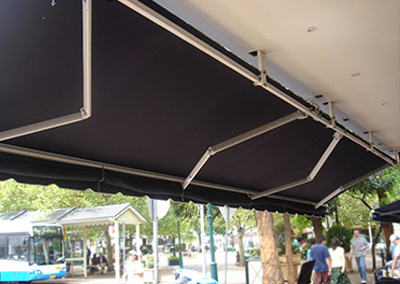 The retractable awning can be operated by manual crank or can be motorised for weather protection at the press of a button. 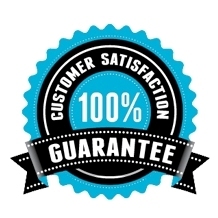 The combination of quality, durable parts and Blind Elegance’s experienced and professional installers means a sensational result every time. 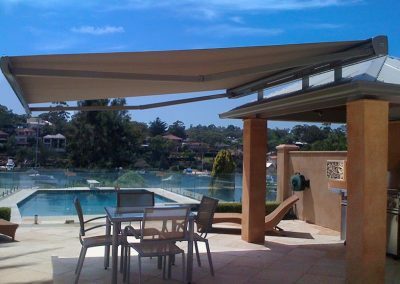 Blind Elegance retractable awnings are operated by remote control – 1 push of a button and you can control sun rain and glare without getting out of your seat. 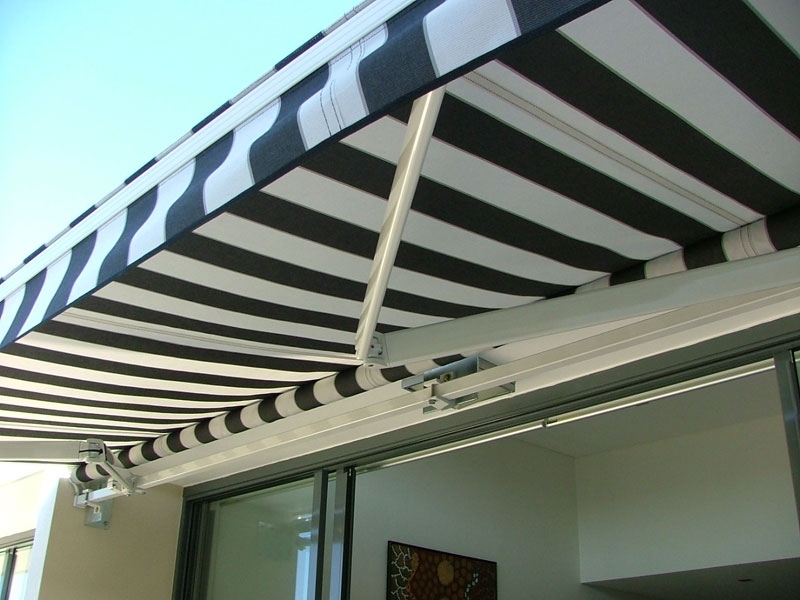 The awning can fully project in under 45 seconds and does so almost silently. Manual operation, via crank and pole are available to the budget conscious as an option to reduce cost. 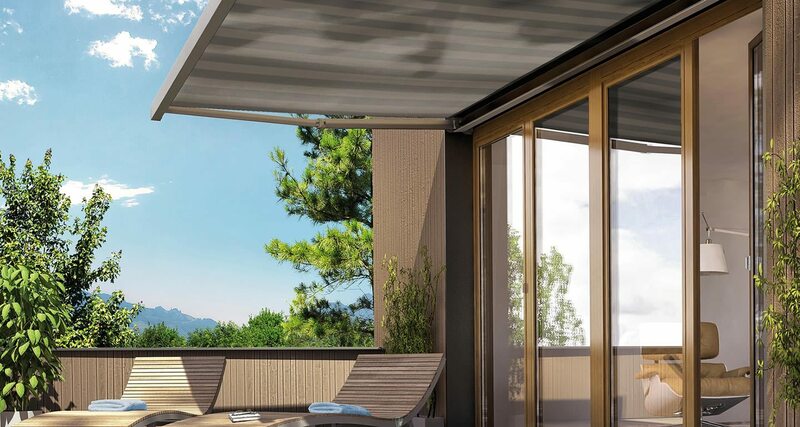 Our retractable awnings have a pitch set at 12°, a standard set by the manufacturer to allow adequate water run off and drainage, so your awning doesn’t bend and bow under the weight of water. Blind Elegance retractable awnings are powered by Becker™ motors External Awnings or Blinds are the most effective form of window covering to reduce heat in the home during summer. 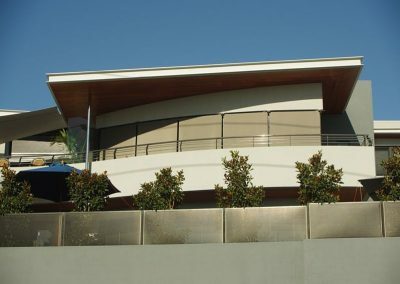 Most of the heat generated in a home or office building is due to the sun’s rays hitting the glass. 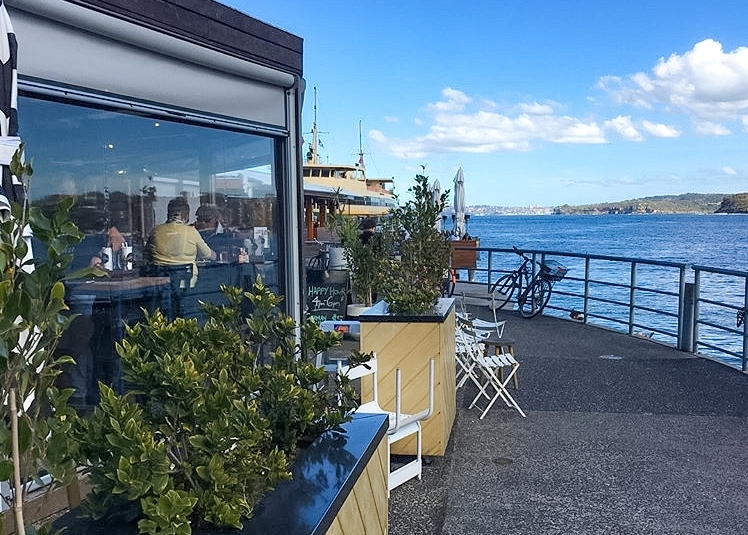 Once the sun hits a glass window and heats it up, there is very little you can do to cool it down. The heat generated here will then enter the home or office building exacerbating the temperature inside. 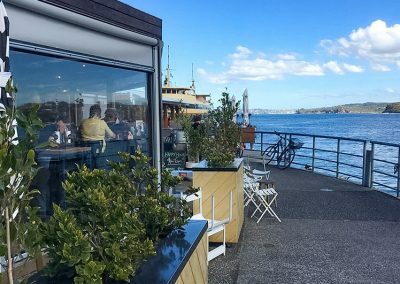 Once this has happened the only way to cool the building down is to use coolers, such as air conditioners, significantly increasing electricity costs. 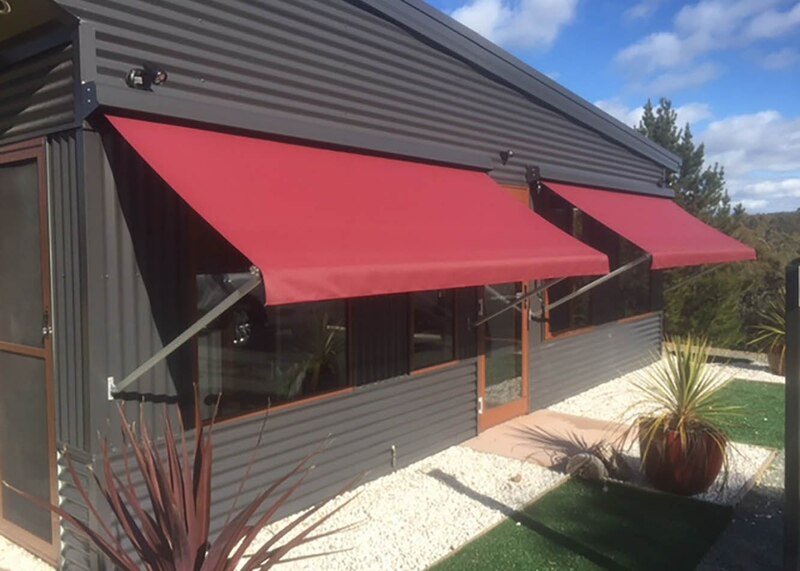 There are many fabric types and styles available to suit your own taste and style as well as many different types of awnings to suit your home and your own individual needs. 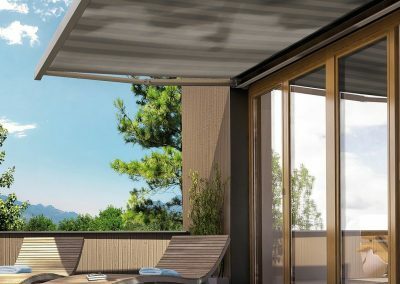 All offer protection from the sun and some will also extend your outside living areas providing shade for you should you wish to sit outside. Automation of these awnings increases the likelihood of you benefiting from the sun protection aspects as the awning can come down automatically as required, depending on the conditions of the day. 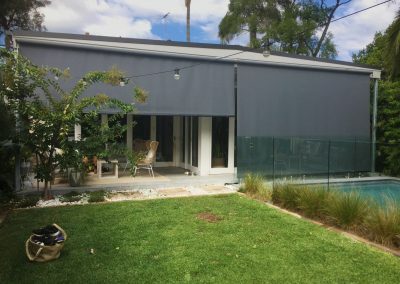 Wind sensors also help extend the life of your external blinds as they will put them safely away should the wind levels increase during the day. 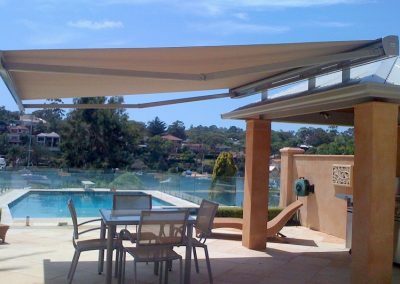 Blind Elegance retractable awnings use only the best of fabrics to protect you, your family and your home from the harsh Australian sun. 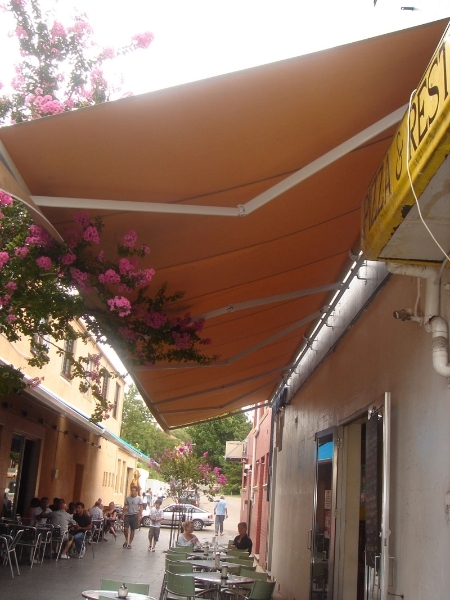 We manufacture our awnings using Ricky Richards dupont teflon coated fabric, a favourite with designers. Our fabrics are U.V. resistant, water resistant and mildew resistant and can aid in the reduction of solar glare, in most cases up to 90%, naturally creating a cool and comfortable space for you and your family to enjoy. One of the feature and benefits of our our awnings is that they can be fixed to a roof tile, a wall or ceiling rafter mounted. 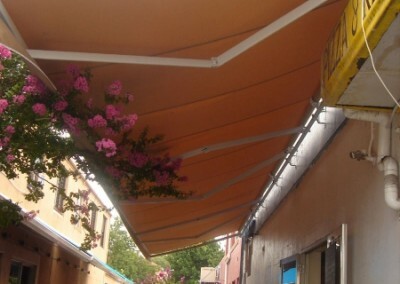 The awnings come with a 5 Year factory warranty.